Road surfaces are known to vary, especially in areas prone to harsh winter weather. Heavy equipment, traffic, the age of the road, and weather play a role in the surface conditions of public roads, private roads, driveways, and parking lots. Cracks, manholes, drains, curbs, and frost heaves have all been known to cause hazards, especially while plowing. 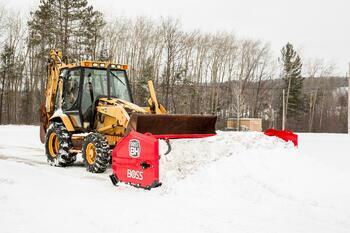 BOSS engineers kept this all in mind while designing the LDR and BH series of box plows. The segmented trip-edge design plays a key role in the protection and efficiency of our box plow line-up. Segmented trip edges also allow the plow to encounter multiple hidden obstacles throughout a push across the parking lot. Often times when there is one obstruction, there will be more. Segmented edges will trip independently over various terrain in the parking lot. This design will allow the plow to maintain contact with the surface, making each push as productive and efficient as possible. By allowing the trip-edge to function in segments, the force of an impact is greatly reduced. When an object or heave in the road encounters one section of the trip-edge, the force transfers into the trip springs and only trips that section of the edge. This design makes the plow much more efficient. If an impact were to happen at the edge of a full-length trip edge (12-16’), the majority of the impact would transfer through the cutting edge as a torsional load and in turn, would force the whole edge to trip. More moving parts are never good and can inevitably cause more problems. The cost of plow equipment was also taken into consideration with this design. Loaders and Backhoes are expensive to maintain and replace. With reduced shock from impacts through the segmented edges, the transferred shock into the vehicle is reduced. Downtime from mechanical failures on equipment is lost production and money. In addition to added protection, the segmented trip edge will allow the operator to more efficiently plow the job site they are on. When an impact occurs and a trip happens, the majority of the snow load will remain in the plow, allowing for little cleanup on the next pass. Consistent cutting edge to plow surface contact will reduce time and cleanup. 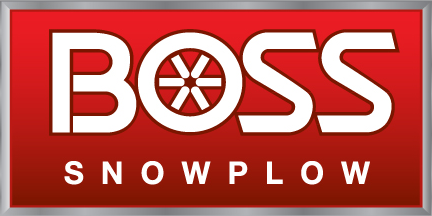 When it comes down to quickly and efficiently clearing a wide open area, BOSS has your back. Segmented trip edges will protect your vehicle, prolong the life of your plow, and increase your productivity. Keeping the cutting edges in constant contact with the road surface will help get your job site BACK TO BLACK.